The weather has finally improved! After sub-zero temperatures and wind chills, the 44 degrees we had to day was a welcome relief! The house is back to pre-Christmas, so I had some time to make a card! Yipee! This is a birthday card using Tilda With a Gift for You. 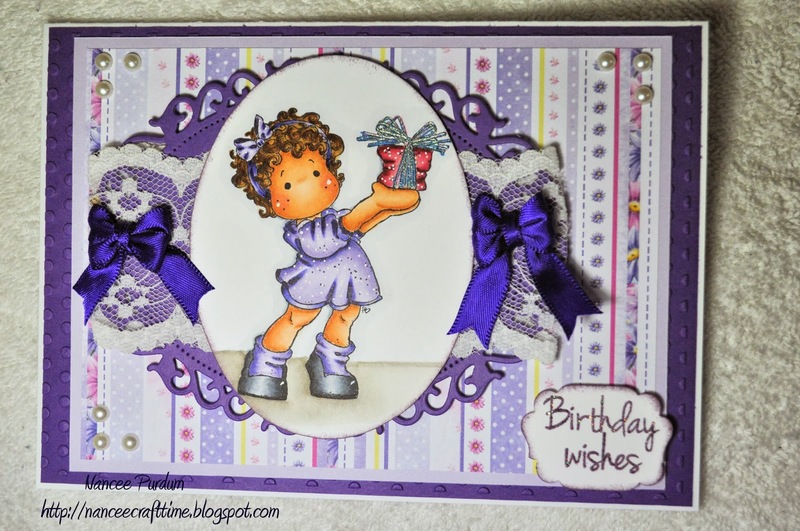 I embossed the bottom layer of paper with a polka dot embossing folder from Cuttlebug and then used some paper from the Bella Paper Pack. I thought it was so pretty! And another. . . . . . . . . 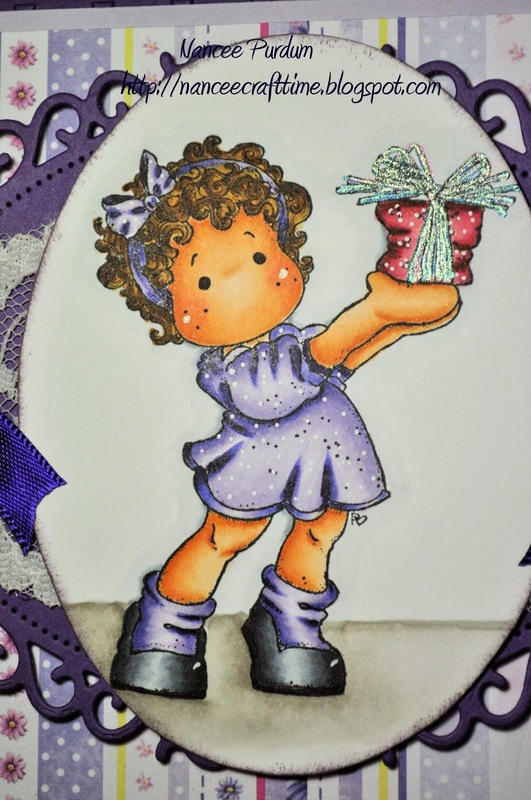 I used Copics to color Tilda and some glitter pens to decorate the gift’s ribbon. I used the Flora Ovals to cut out a frame. I was going to cut out Tilda, and then decided to turn the card and cut out Tilda in an oval and add it to the frame. I added some lace to the frame and then hand cut the oval with Tilda.. I put some dimensionals on the frame and sentiment to pop them up a bit. I thought this was a little different than what I normally do and am happy with the way it turned out. Here is a close-up of Tilda. . . . . . . . . I added a sentiment at the bottom, and again tried something different. I used a punch from EK, but thought it was a little big. I saw someone on Pinterest show how to use a large punch and make a smaller tag from it. It worked great! I will certainly have to remember this! I used my Bow-It-All to create the small bows. I love the Bow-It-All. It makes perfect bows every time, and any size! I always made my bows myself, but this makes them perfect every time, and they are still “handmade”! Here is one more look. . . . . . . .
Oh, me likey, Nancee! I love the shading on your Tilda's clothing! Well done! I am such a coward – my Copics just sit there looking all sad and neglected because I am afraid of them! You've done a great job and you card is darling! So pretty and love your colors and design. You've created a fabulous card! Nice coloring and details. Oh so delightful Nancee! Love the purple and you did such beautiful coloring on this image. Now I've seen your tag I need to look up that technique! Deeelightful creation! 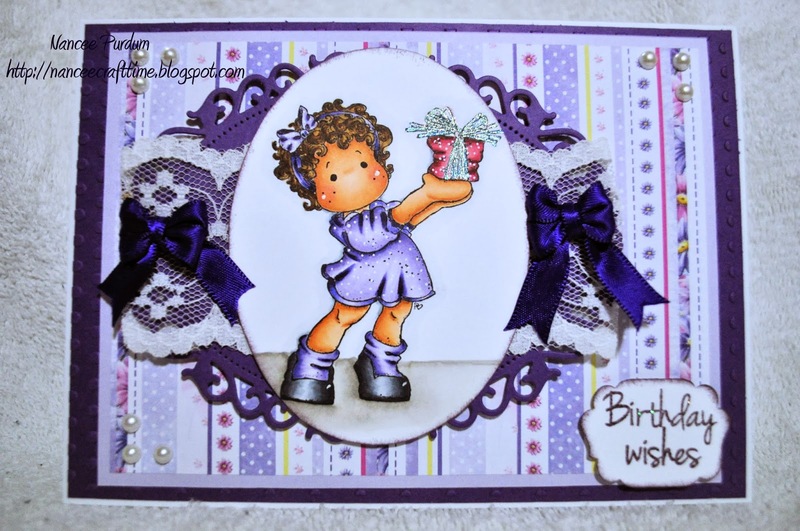 This card is stunning, I love the purple colours and the Magnolia is very sweet. Beautiful, Nancee. I love the purple, fabulous coloring. Your bows are adorable. I love my Bow-it-all tool. Tilds is colored beautifully! I love this card and I must look into this Bow-it-all. Darling Nancee! Beautiful coloring and I love the polka dots! Beautiful colored image, papers and bows. 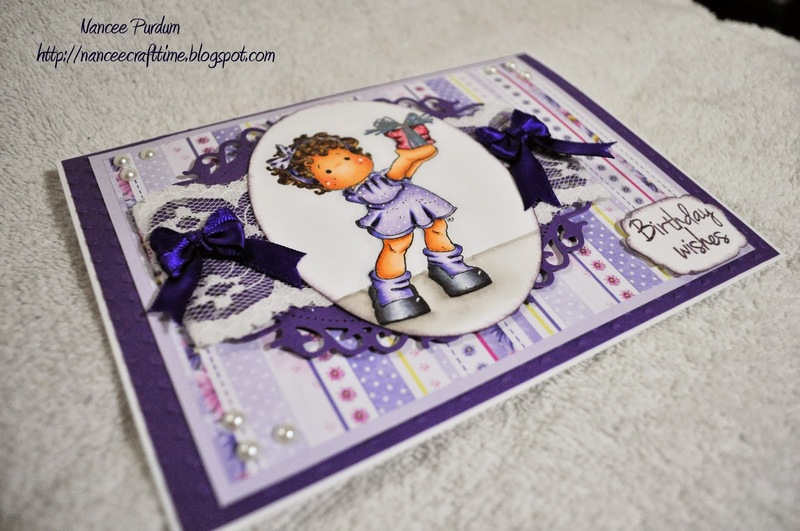 Lovely card,love the colours ,thanks for sharing.